Hainan is a tropical island located of the south east coast of the mainland. Often referred to as the Chinese equivalent of Hawaii it is famous for it’s white sand beaches, tropical mountains and relaxed coastal vibe. The islands ultra modern capitals, Sanya and Haikou are often compared to Dubai and boast world class International Schools, golf courses, medical facilities, restaurants and international hotels. Recreational activities include surfing, swimming, scuba diving, golf, hiking and fishing amongst others. 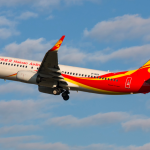 Hainan Airlines, headquartered in Haikou is Asia’s fourth largest airline, operating to over 90 cities from various ports in China including Beijing, Shenzen, Guangzhou, Shanghai, Xi’an, Haikou and Chengdu. Hainan Airlines has a fleet of more than 300 aircraft, consisting of Boeing 737s, Boeing 787s, and Airbus 330s. With over 80 aircraft on order. Hainan Airlines is the most progressive foreign pilot employer offering a variety of rostering options to accommodate commuting or residential employment. Hainan also employs the largest number of expatriate pilots in China. Hainan Airlines rostering options include a commuting option of 4 weeks on, 4 weeks off, with commuting flights provided to all Hainan Airlines ports. Hainan Airlines will contact Flightdeck to advise the outcome of the screening process and to request your availability to attend the next stage of process.